My family just had the most crazy 24 hours. It started with my son complaining of a stomach ache (hour 1) and ended with us being discharged from the hospital (hour 24) after an appendectomy. I pretty much instagramed the entire drama as it unfolded, so for those that are into instagram (my new favorite social media toy), you’ve probably already heard this story. While we were out running errands Monday night around 7:30pm my son started complaining that his stomach hurt and he didn’t feel good. He said he was nauseous. I told him to just sit tight and that we’d be home soon. By around 8pm he was complaining that his side was hurting. We were almost done running our errands, we just had one more place to stop. At this point it was about 8:30pm. Travis was obviously not feeling very well so Ben just ran into the store while I sat in the car with Travis. During the next 30 minutes he went from just a mild aching in his stomach and lower right side hip area to a full-on screaming and crying attack. He was literally beside himself screaming and crying in the car while I sat next to him trying to comfort him. 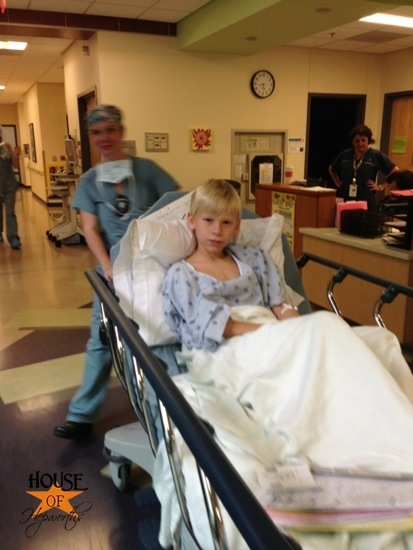 Normally I don’t run to the ER for every small ailment, but Travis was in so much excruciating pain in his appendix area that I felt like we should have it checked out. Fortunately the ER was about a mile away so we just headed over there at about 9pm. He was checked in and put into a room right away. They put in an IV and immediately withdrew blood. He was still crying and whaling and obviously in a lot of pain. After maybe 45 minutes or so they took him in for a C/T scan. On the way to the C/T scan room Travis threw up several times. From that point on he acted totally normal and said he wasn’t in pain anymore. The nurse said she was 99.9% sure he didn’t have appendicitis so Ben and I were a little irritated that he had just had a C/T scan for what looked like a belly ache. We sat in the room for another 20 minutes frustrated that we were in the ER paying for all of this (ER, C/T scan, etc) for a bout of gas. I was annoyed with myself that I was one of “those moms” who freak out and race to the hospital for stomach gas. I think it goes without saying to mention here that we have absolutely no problem paying money for our children for any medical issue that arises. I would go bankrupt making sure my children have the medical attention they need. But when you are facing a $2000 bill for a stomach ache it can be aggravating. And yes, we were slightly aggravated, but trying to not let our son know how frustrated we were. We had wasted several hours by this point and probably around $2000 that we are going to have to pay 100% of because of our high-deductible HSA plan (Ben is independent so we have private health care). I just wanted to go home and put this disaster of a night behind us. Turns out the very expensive C/T scan was worth the money after all. And take note, from first symptom (stomach ache) until he was diagnosed was only 2 and a half hours. 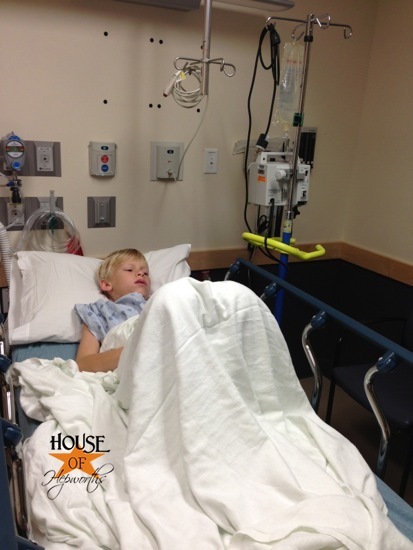 If your child has excruciating pain exactly where the appendix is located, take him in! The doctor transferred Travis to the Children’s Hospital downtown via ambulance (without the sirens, lights, and speeding. Booo). Ben rode with Travis in the ambulance while I went home, packed a bag for my overly tired daughter, and dropped her off at my inlaws at midnight on my way to the hospital. Travis could not have been more excited about this ambulance ride. 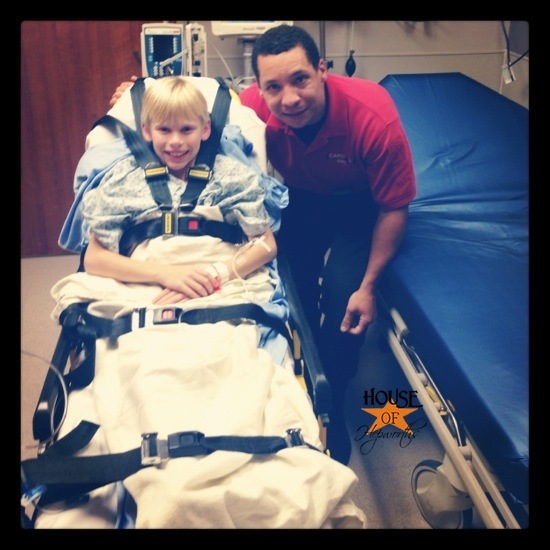 Most kids would be scared about being sick, and nervous about the ambulance ride and all the restraints used to hold the patient down, but not Travis. He loved every minute of all the attention he was receiving. He was so excited to ride in the ambulance. He called me during the ride and told me how much fun he was having and how great the ride was. 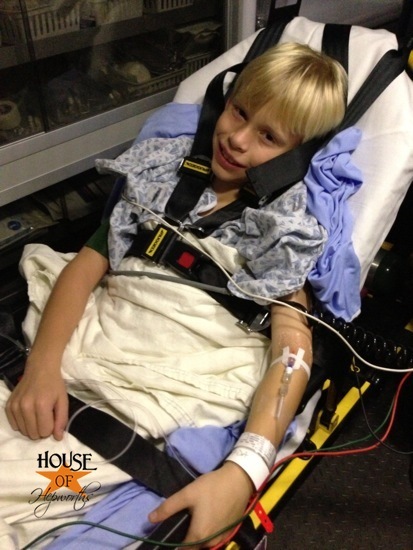 He is thrilled that he can now check “ride in an ambulance” off his bucket list. We sat in a private room in the ER waiting to hear when the surgery would be. They told us they couldn’t admit us because they had no rooms available and we would have to just hang out in the ER. At least we were in an actual room and not in the hallway. Finally, at 3am we were told that the surgery was scheduled for 8am and he would go into pre-op at 7am. Because we lived so far from the hospital (about a 30 min drive) it didn’t make sense for either Ben or me to go home to sleep so we both stayed in the ER room with Travis. I finally curled up in fetal position at the foot of Travis’s bed and got 4 hours of really terrible sleep – no pillow, one thin blanket, in fetal position, with nurses and beeping interrupting us every 15 minutes. At 4am they took pity on Ben who was sleeping sitting up in a plastic chair with his head against the wall and brought in another bed for him. At 7am they woke us up and took Travis to a private pre-operative room where we answered the same exact questions about his condition (last time he ate, last time he peed, what time the symptoms started, what hospital we started out at, etc) to a variety of nurses, doctors, and staff a minimum of 10 times. At the Dell Children’s Hospital they have employees whose entire job is to talk to the children about what condition they have and what to expect in surgery and recovery. They are called a Children’s Specialist something-or-other. She was super nice and talked to Travis on his level but also treated him with respect and didn’t talk down to him. It was very sweet to see them interacting. Never once during the entire drama that started the night before at 7pm did Travis ever, even for a second, act scared or nervous. Yes, he was in pain, but to him, a hospital stay, an ambulance ride, getting to use a wheel chair, and having surgery were all just the best things to ever happen to him. He has a very positive outlook and saw everything unfolding as an adventure instead of with fear. He is a tough little cookie. Finally it was time! 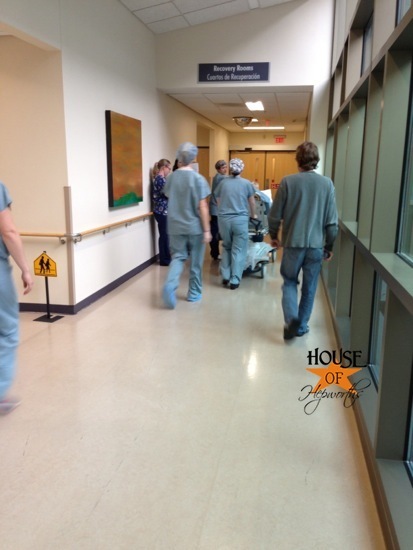 They wheeled him out of the Pre-op room and down the hall where we said goodbye and watched a team of nurses and doctors dressed in powder blue scrubs and hats wheel our baby away into the surgery room. 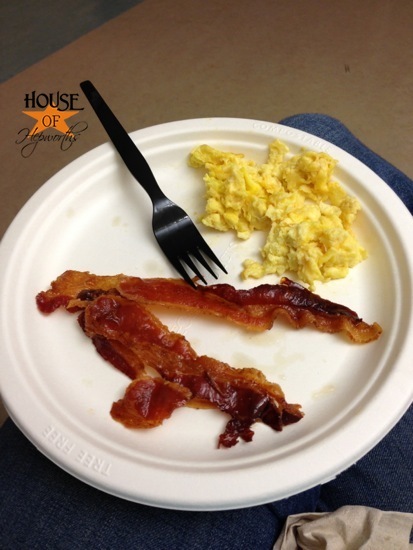 We busied ourselves by browsing social media on our phones (facebook, instagram, google reader, etc) and eating a hot breakfast that Ben picked up from the cafeteria. Before we were even settled and comfortable, ready for the long haul, the suregon came in and told us she was done! The surgery went great and Travis was already in the recovery room. We could go see him in about 20 minutes. I can’t believe it was so quick. By about 10:30am he was in a private room just chillin’ and resting. We were told all day he would be there at least one full night, so all day we prepared ourselves to stay. Travis had a slew of visitors who brought balloons and toys. He kept saying how much he loved being in the hospital and how much he loved all the attention. Eye roll. He was up trying to walk around and get himself moving by noon and spent the afternoon recovering, hanging out in bed, walking around, paying with a wheelchair (another bucket list item he can now check off the list), visiting the gift shop, and pretty much just enjoying how much attention he was receiving. By 6 we were on the road, stopped at a McDonalds drive thru for ice cream, and were home by 6:40pm or so and Travis was in my bed fast asleep by 7:30pm – exactly 24 hours from when he told he was feeling sick to his stomach. He slept a full 12 hours and woke up sore, but very chipper this morning. Like I said, he is one tough cookie. The last 24 hours has been a total daze. It came on so fast, I didn’t have time to think or prepare for it, and now it’s over. It seems like it was a dream. Like it never happened. Everything went perfectly, from the surgery to the swift recovery. He’s now taking it easy at home playing games on the iPad, watching tv, reading, and playing with a coffee table full of legos. There’s nothing like spending a day at a Children’s hospital to remind you just how blessed and fortunate you are. 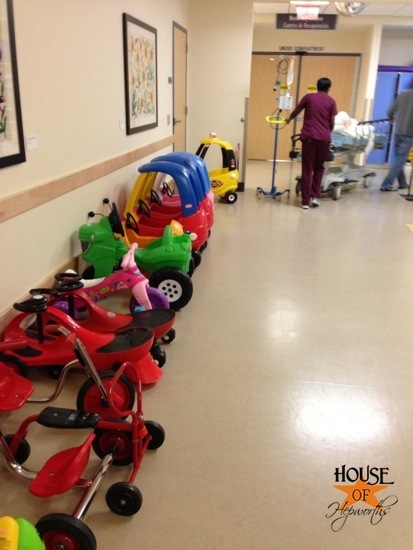 There were so many sick kids. I don’t mean appendectomy sick, but really really sick. Like, might-not-make-it sick. Toddlers on IV’s and bald little adorable heads. Teenagers on respirators fighting for their lives. On our way to our car we saw family and friends gathered for a Memorial Service for a beautiful 16 year old girl who just lost her battle with Cystic fibrosis. I cry for them and their families and am just so grateful to have two perfectly healthy children. I think I needed to be here, especially at the beginning of this holiday season, to help remind me that this Holiday Season isn’t about getting stuff, it’s about family and being grateful for yours. It’s about giving gifts to show your love for that person, not just so you can get stuff. 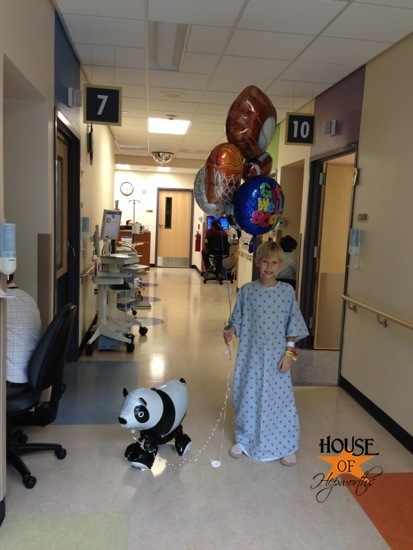 It’s about celebrating the blessings in your life, like healthy children and family who would drop everything to bring balloons to your 10 year old after surgery. We are blessed and grateful. Travis’s appendicitis couldn’t have had a better ending. Tummy ache to retuning home from surgery at the hospital in 24 hours? The best outcome I can possibly think of. We all have lots to be thankful for this season. Wow, sorry you had to go through all of that, but he sure does sound like one tough cookie. And I’m glad it all seemed to fall into place to get it all taken care of. Your son is in my thoughts, and I hope he has a speedy recovery. Glad he is doing well! 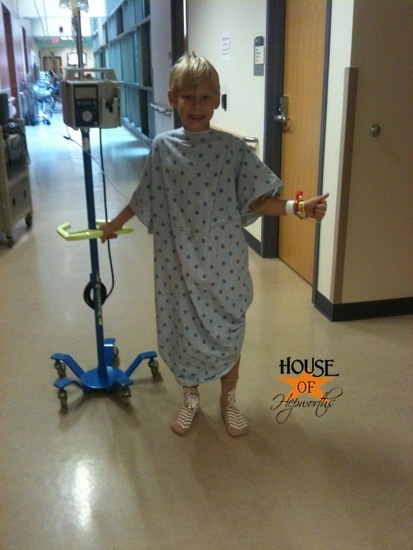 I had my appendix out when I was about his same age, and it was a much longer process and much longer hospital stay – not to mention a much larger scar! So grateful for the advances in medicine. What a tough little guy! Oh my! How scary! I’m glad he’s feeling and doing better! Thank you for also reminding me that I have lots to be thankful for! Sending love and prayers to families all around! I’m so glad you’re story had a happy ending! Your son is awesome, with his enjoy-the-adventure attitude!! Thanks for sharing and take care. Holy cow! I am so relieved that he is ok! You must have been so frightened! So glad that it went so well!! I love his great attitude through the whole thing — I’m sure that made it so much easier! 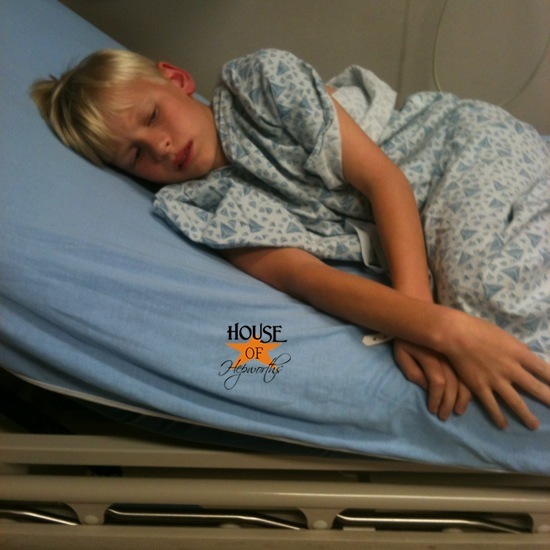 2 years ago, my son (now 13) had appendicitis, but when I took him to the doctor after a couple days of stomach pain, she diagnosed him with gas and constipation, so we took him home and for days tried apple juice and stuff to get things “moving”. His appendix ended up bursting and we took him into the ER, he had immediate surgery and the ER doctor told us it was the worst case he’d ever seen. He ended up recovering in the hospital for 2-3 weeks. If we’d waited any longer he probably wouldn’t have made it. It was such a scary experience, but I felt the very same way afterward….just overwhelmed with gratitude that he was ok and it wasn’t something life threatening! I’m really happy for your family that you’re all well again and home with each other! Mara, that is awful that the doctor misdiagnosed him! I am so glad he turned out okay in the end, but what a nightmare. Best wishes to Travis!!! I’m so glad he enjoyed the very same episode that had you anxious about all kinds of things, I am sure. 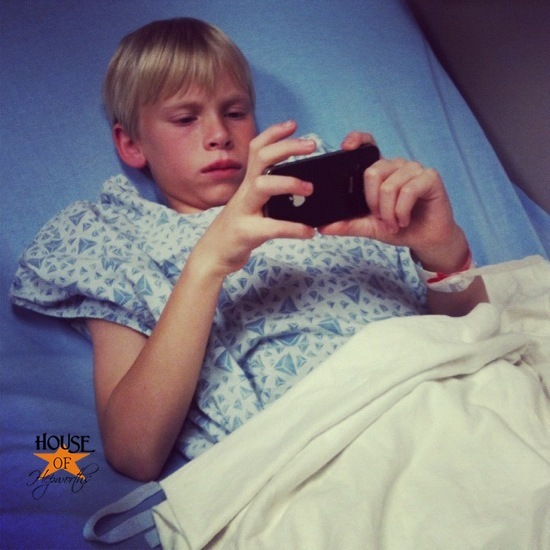 As for seeing the other kids who are “really sick”, I had that same experience when my son had outpatient surgery at the Children’s Hospital in my area. While the husband and I were in the waiting room, a nice lady came around with a basket of handmade, simple but cute teddy bears – just some scrap fabric and a face drawn on with a sharpie – that had been donated so the kids could wake up to a little comfort. I thought, “How sweet!” and grabbed a red one out of the basket. A few minutes later, from across the room I heard a Mother say, “Oh let me have the green one – now he’ll have one in six different colors!” And BAM! That’s when I realized how lucky we were to only have one little bear. Travis…maybe you are going to be a Dr. someday! I’m pretty sure there are plenty of kids who could use someone who sees the whole hospital experience as exciting and not frightening! Alison, it is so true that you are blessed! I had the same type of eye opener this week. My daughter has a small hole in her heart, she was diagnosed with it when she was born. It was so scary, but I remember the Dr. saying that if something is going to be wrong with your child, you want it to be this. It didn’t really make sense then, but almost 10 years later…I remember those words so clearly every time we are in the hospital for a check up. We visit the cardiologist every few years, and probably will for the rest of her life. However, it is precautionary. Each time we see so many kids on a first name basis with the staff…kids who are so very sick. My heart aches for them and their families. This trip the Dr. even apologized for the reality that we would have to be here for check ups for the rest of her life. Really? Not a problem. I’ll take the check ups and the reality check for how blessed we truly are! Thanks for sharing Travis’ “adventure” and also for the story of your friend Brittany. I went to donate…I think everyone should put donating to this Mom at the top of their Christmas list! Any chance they have a facebook page or somewhere to keep in touch? Thanks for sharing your story about your daughter! I’m glad she’s doing great. Oh wow! What a story! I’m happy he is OK after such ordeal! Wow! Craziness going on in your world. I’m so glad Travis is doing well and had such a fun time. It’s all about the attitude, right? We can all learn a ton from him! I’ll be praying for Brittany and her family. Your post made me cry. Thanks for writing it and reminding me of my blessings! Oh, you poor guys! I am so glad he is doing better. Aren’t you glad you didn’t have to stay that second night! 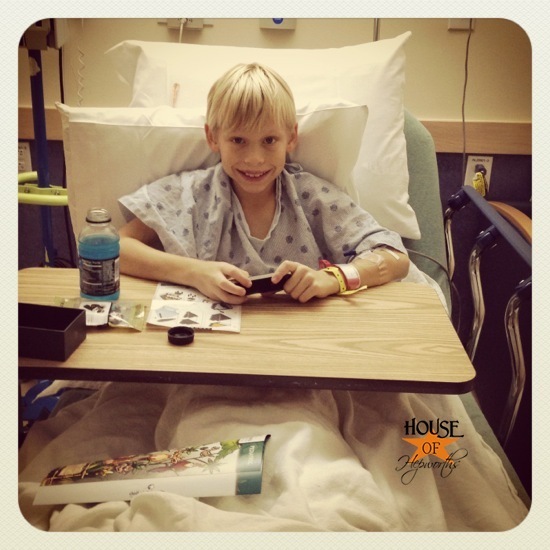 So happy your little man is feeling better – he’s one brave kid! And you’re amazing for staying so calm!!! I was totally traumatized when my 3 year old fell and needed stitches right above his eye and he was super brave throughout the entire ordeal. Hope he continues to have a speedy recovery. What a beautiful post about your little Travis (so big! so brave! children are amazing) and Brittany. So sad, I can’t imagine. Thank you for your fundraising efforts, I hope they pay off. No pun intended, for real. I am so glad you had such a good outcome! You have one brave boy there… he should be so proud of himself! You too, Mama! What a whirlwind, Allison! I’m glad Travis is doing well and that he enjoyed his stay in the hospital. 🙂 So very true about counting our blessings, especially this time of the year. Shhheesh! 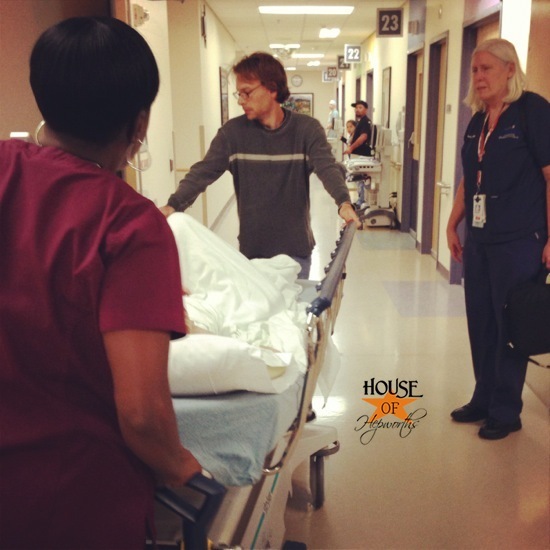 Hope he continues to recover well…thanks for sharing the experience. I love your details. Poor little buddy – wow that is amazingly fast. 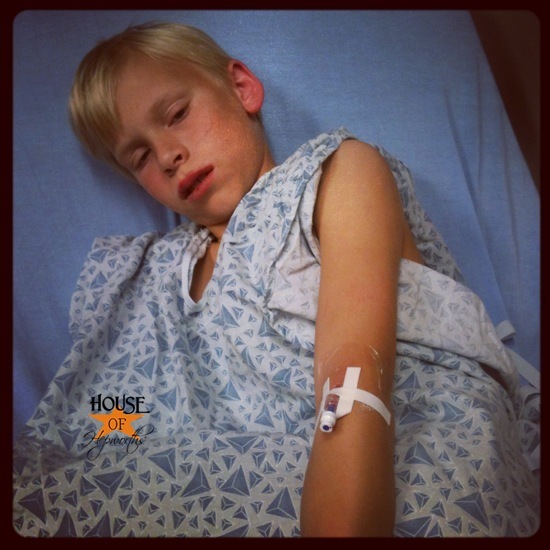 And you were smart to listen to that “mama voice” – my friend’s son had such a similar thing happen, but they kept thinking it was the flu….finally went to the ER (don’t those things always happen at night or weekends?) and were told it was his appendix, but they had time to drive to the hospital and stop at home for a bag. Ended up waiting for 8 hours for his surgery, and his appendix burst just before they started surgery. 5 days in the hospital! and we have the same insurance…8 stitches on my fingertip cost $2000 one evening at the ER. Similar thing cost my husband $300 during the day. Wow! So glad he is ok! I totally understand how you felt about taking him to the ER when you thought it was just gas. So glad they found out the real problem though and didn’t just assume that’s what it was! My mom had docs to do that with her once, and after taking her to the ER 3 times in 24 hours, they discovered she had bleeding on her brain! After we got her out of that hospital and transferred two hours away, turns out it was old, but there for a while it was scary stuff….but she is ok now! You’re right, we have so much to be thankful for that we often times take for granted. I saw a video today of an 8 month old that received cochlear implants and when they turned them on and he heard his mother’s voice for the first time. It was precious. I am expecting baby #2 on Dec. 27, and it makes me thankful that my kids can hear. (Baby girl moves around a lot when she hears Daddy’s voice!) Just a little thing, but with all the busyness of this life, we can sure forget how blessed we really are. Sorry for the rambling post. I am really glad Travis is doing so well! We had a crazy month this past February with my daughter going to the ER 4 times. The first visit we thought it was appendicitis because she was doubled over in pain. (her dads burst as a child so she is higher risk) That visit we found out she had mono and the pain was from her spleen. We were shocked since she was only 10 at the time. A week later, her pediatrician sent her to the childrens ER about 40 mins way because she thought it really was appendiciits that time.. After several hours of tests and an ultrasound, it turned out to be adenitits, which is inflammed lymph nodes in the same area as the appendix. Two days after that she ran into her brother and fell to the floor with more intense pain. The ER dr thought her spleen burst, so she had an emergency cat scan. Luckily a false alarm, and she was sent home several hours later. 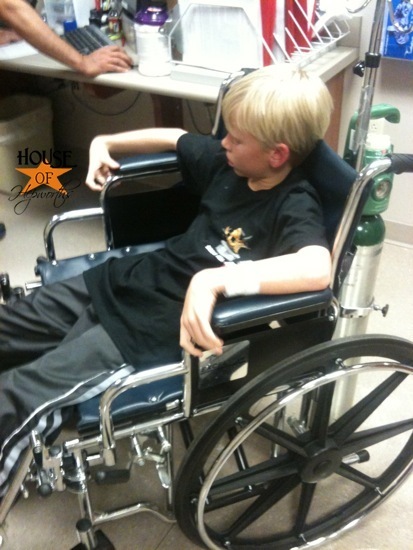 A week later we were back in the ER once again with severe pain. The dr she had that day said she wanted to take an Xray because she wanted to check something. That pain was severe constipation from being sick and taking Ibuprofen for several weeks. We were told that was common for the digestive system to slow down in cases like hers. Once that was treated she finally felt okay again 25 days after the ordeal. started. 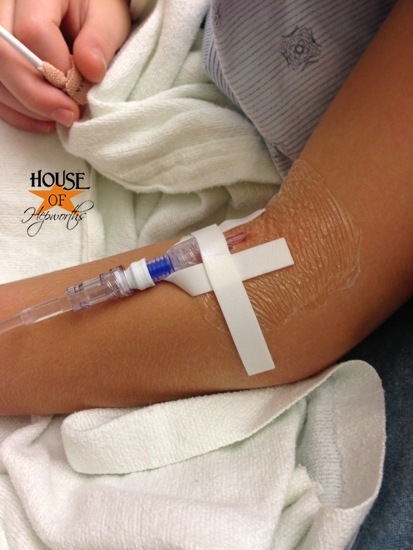 By the 4th time in less than a month, she was so over the IVs, Drs and tests and going to the ER… So happy to hear that your son is doing so well and rebounding so quickly! I love how he had a such a great attitude about the entire thing. Thanks for the reminder of how blessed we are to have healthy children. Isn’t it crazy how unafraid little ones are sometimes? We had a similar situation with our 6 year old daughter this summer and she was completely unfazed. She was having issues breathing and we took her in around 9pm only to get shipped to the children’s hospital (via ambulance of course) around midnight. A few breathing treatments and new shiny inhaler later we were home around 9am. It was a long night to say the least. Other than the oxygen tube having to be in her nose (to help her breath) Carson was unfazed. It’s pretty safe to say she enjoyed it as much as Travis did. It definitely makes things easier for worrying parents that’s for sure! I’m glad everything went ok with his surgery. New reader here too! I look forward to reading more! I’m so glad she was okay. I wish I were fearless sometimes like kids are. No worries in the world. I was like that until I had kids. Then I became a worry-wart! Glad you are here. I’m glad you took him to the ER so quickly! My son has had an appendectomy too. Not because he had an appendicitis but because when he was 5 we discovered he had a serious birth defect called intestinal malrotation. Basically, he had to have his intestines “untwisted” because things were in the wrong place and causing tummy aches. It can be a life threatening condition if not fixed. I am so grateful for his quick diagnosis. We had his appendix removed because it was in the wrong spot and it would be hard for us to tell if he was having pain from an appendicitis or not in the future. God bless you and your precious boy! I have a friend who’s daughter has that condition. So scary. Glad your son is okay now. I wish him nothing but the best in his future! I’m so glad to hear your son is feeling better. I had appendicitis when I was 19, right after my parents moved out of state and I was just learning how to get by on my own. Even though I went to the doctor and even the hospital several times, it went undetected and ruptured. It took the doctors a month after it ruptured and I had a football-sized abcess in my lower back area to figure out what happened. A nurse even told me that if I didn’t admit myself (for the 3rd time) to the ER after they turned me away the first 2 times, I would have died within a few days. It took me 3 months, in 3 states, and at 3 different hospitals to recover, along with several drainage tubes and surgery. It was a really scary time in my life, especially being so young and on my own, but it really made me realize what is important in life. I’m tearing up just thinking about how horrible it was, but at the same time it really made me appreciate the small things every day. And for that, I am thankful. Life may not always be perfect, but if you appreciate the small blessings each day holds it makes the little annoyances fade into the background. You’re such a good mom and glad you boy is better! This is late, however may help others…. Here’s a tip to help guess an appendicitis vs. belly ache. 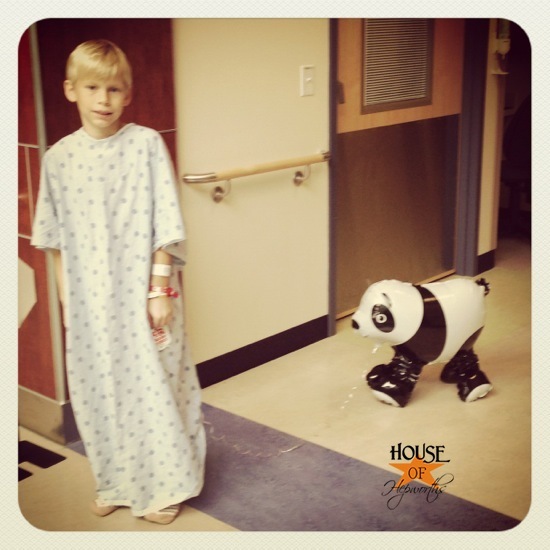 It worked on my older son, who was reluctant to go to the hospital and it saved his life. The appedix is located on the person’s right side; lower from belly button. Well, if you press (and do this when your child isn’t noticing), firmly in the same ares but of the opposite side – the left side, and he jumps in coming pain from the APPENDIX SIDE take him in right away! Oh man! I’m glad your son is ok. It a pretty scary situation. My husband has his removed about 6 years ago, however after seeing his brother go to the hospital thinking he had appendicitis when he really was just constipated, he put it off for a while. Like 3 days. 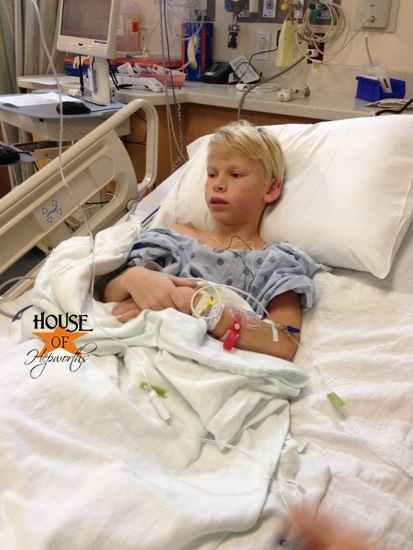 After surgery they informed him that he had gangrene in his abdomen and had to stay in the hospital for three days. Oh men! When will they learn? 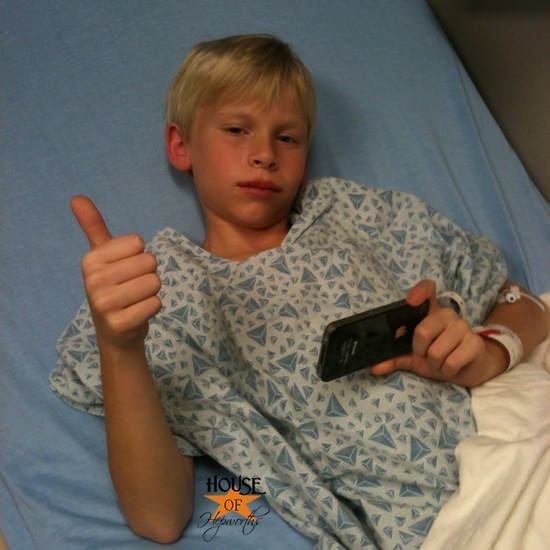 So did your son’s appendix actually burst? The doctors told my husband that is why he was feeling better the second day. When it burst the pressure is released. My husband likes to say he’s in the Would’ve Been Dead in the 1800’s club, I guess it’s got a new member.